I have created a user profile property of type string and i pick a term set for this property. How to map this user profile property to managed property in order to search work? This should be very easy. When you create the custom user profile property you have to make it "searchable"
After this you can crawl the people data in your search service application. The search will create a so called "crawled property". You have to map this crawled property to a managed property. 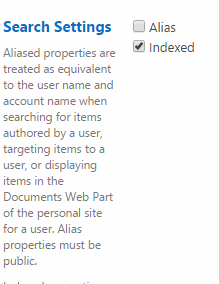 After this the custom user profile property should be visible in the search center - but only if you display template/xslt render this property. If you need further instructions please leave a comment. For a user profile property to become a crawled property, it is important that in the user profile service > Manage User Properties > Edit user profile property the policy settings > Default privacy setting is set to 'Everyone'. You could create another column that is a managed property and copy the values into it. Not the answer you're looking for? Browse other questions tagged user-profile enterprise-search managed-property or ask your own question. MultiValued string profile property limitation?